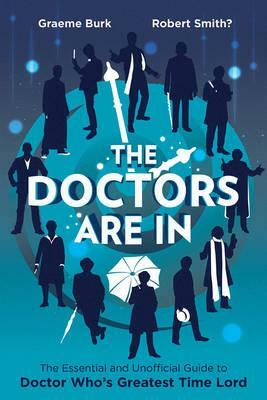 The Doctors Are In by Graeme Burk and Robert Smith? TRUE FACT: The ONLY Doctor of the modern era I have looked forward to “meeting” is Peter Capaldi. My reaction to the reboot in 2005 was: “A Doctor in a black leather jacket? NEVER. GOING. TO. WORK.” And then I loved Eccleston’s Dotor, so much that when he regenerated, I said, “New guy? I’ll hate him.” LOVE David Tennant. May be my favorite Doctor. Loved him so much that when HE regenerated, I said, “Who could ever follow him?” Enter Matt Smith, whose introduction was all but perfect. How is it that for over 50 years and 13 incarnations, each subsequent actor is able to both take on the mantle of this character AND make it his own? Sometimes the authors agree with each other. Sometimes they disagree. Sometimes they call each other crazy, and then vehemently defend their position on why they are right and the other is wrong. MY TWO CENTS: This is a pretty decent roundup of all the Doctors. If you’re unfamiliar with the earlier Doctors, you can get a snapshot of their eras. I especially enjoyed the background on each actor, and the general climate of the BBC during each tenure, and how that affected production. Readers may take exception to the “bashing” of favorite Doctors or episodes. For example, one author despises David Tennant but adores Matt Smith. The other loves Tennant, but points out Matt Smiths’ bad moments. It’s definitely an eye-opener to different points of view. I was just relieved that both authors felt the episode “Midnight” was worthy of mention. I probably would have stopped reading if they hadn’t. NOTE: The authors state upfront that the book will only cover the TV series, and not other media like books, comics, or the Big Finish audio dramas. For example, although the Eighth Doctor has had a very healthy tenure in other media, the only appearances covered in this book are the TV movie and the Night of the Doctor. BOTTOM LINE: I’m interested in checking out the authors’ other Doctor Who books, such as Who’s 50? If you’re open to hearing criticism about your favorite Doctors and episodes, and even mentally debating with the authors, give this a read. TEACUP RATING: I give the book 3½ out of 5 teacups. ON SALE DATE: The Doctors Are In will be on sale in paperback and ebook formats on September 1, 2015.